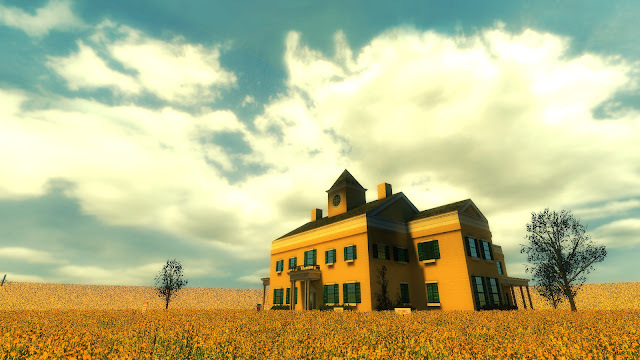 The limits of a conceptual VR student game; and what would a "better" game about 9/11 look like? The internet has been abuzz about "8:46", "a narrative driven experience designed for virtual reality, which makes you embody an office worker in the North Tower of the World Trade Center during the 9/11 events." The game itself suffers from a lot of problems. If I were to ignore the politics, there's plenty of production values to critique -- the characters have blobby sculpts, inconsistent lighting, and stilted voice acting -- the particles are really really awkward -- and the one thing I like is the floorplan, especially the cramped corner office you begin in, which feels like a pretty authentic detail of old NYC office buildings. But who are we kidding, this game is totally a political work, and it is much more generous to the developers to interpret it that way. Most people are just going to talk about this game instead of actually playing it, which is OK, and that's what compels me to write about it: I think this is a very flawed conceptual work, and I want to talk about why that is. (1) TECHNOLOGY. Using virtual reality was not a good idea for this project, especially in this early generation of VR where it is mostly positioned as a nascent platform and consumer market that desperately needs to prove itself. Anything using VR in these early years is, inherently, saying, "look at me, I'm using VR!" That's an OK thing to say, but it centers the technology instead of what you're saying with the technology, which is probably not what you want to do for a 9/11 game that's supposedly about respect for the dead rather than how this cool new peripheral? To be clear, I think you could make a game that powerfully critiques Western attitudes toward the dead and who is allowed to talk about the dead; I don't think this is that game. This post gives vague conceptual SPOILERS for The Beginner's Guide, and spoils a few specific moments. You really shouldn't worry about it, I mostly just talk about me in this. I was one of the people who secretly played The Beginner's Guide long before its public release. Why was I given access, and not someone else? Well, that's kind of what the game's about: a "Davey" who is talking through his relationship with another designer named Coda. Who did Coda want to play their games? I remember playing this seven months ago (back when it was simply codenamed "The Author") and suddenly thinking... wait, is Coda supposed to be me? Radiator 1 notes, memories, and regrets. 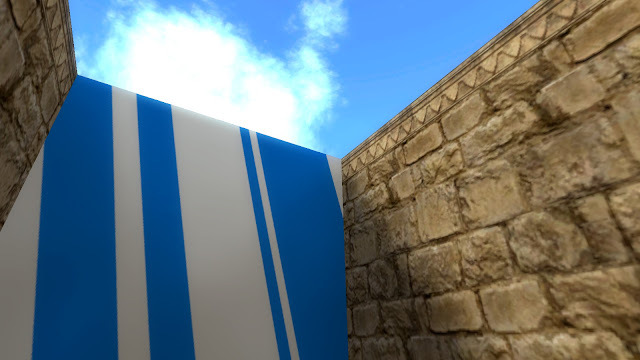 NOTE: This post talks about Radiator 1, and spoils much of what happens in it. I've cleaned up and re-released an old single player Source Engine mod of mine called Radiator. It is free, and anyone with a Steam account (Windows, OSX, or Linux) should be able to play it. It consists of three standalone chapters -- Polaris, Handle With Care, and Much Madness -- the first two chapters were released in 2009 on-schedule, but the third chapter has lingered unreleased for the past 6 years. Each passing year I've threatened to actually finish it, and today, I've finally made good on my threat. What suddenly changed now? Well, I actually haven't finished Much Madness exactly... what changed was more my attitude. It proved difficult impossible to "finish" a game that I designed and wrote 6 years ago, from a very different time in my life. I don't have access to those moods or sensibilities anymore! So instead, I'm just going to release it in its pretty rough state, and accept how incomplete and unpolished it feels. 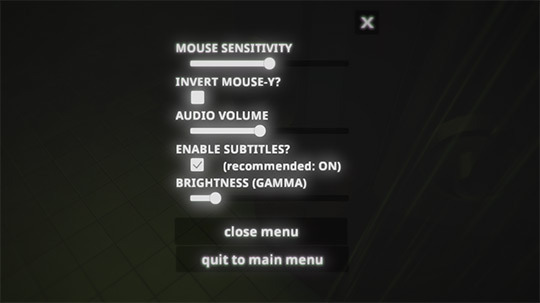 I recently implemented an in-game options menu in Unity. Mine looks something like the thing above. A surprising amount of the required functionality is already implemented in Unity, you just have to write some code to hook into it. In the cases when Unity didn't already have a static variable for a particular setting, like mouse sensitivity or menu language, then I'd implement my own static variable that worked with a specific PlayerPrefs key. Games are primarily conceptual / performance art; games are culture; it's more important to witness a game than to play it. Most people haven't played most games. Conversations about games often start with "oh yeah I've heard about it" or "I haven't played that yet." Thinking about the vast intergalactic politics of EVE Online is so much more interesting than trying to play it, and watching high-level Starcraft play is much more interesting than drilling on a specific build yourself.